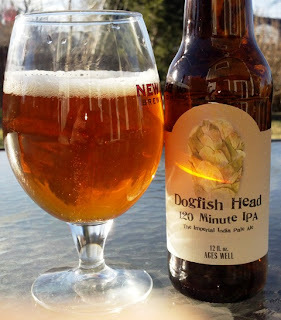 If you are a hop-head who really loves big IPA's, you are very likely going to love it. According to their website, it is 15-20% ABV and 120 IBUs. To me, all that alcohol makes it too sweet and "boozy". I don't feel that the hops cover that sweetness. Untappd has the 120 minute IPA at 4.16 stars out of 5, so my opinion is not shared by the typical craft beer drinker. I suppose you could say it is just too extreme for my taste. Perhaps I'm just not worthy. It is, of course, one of the beers that appears on on Zymury's 2011 list of the best beers in America. It is tied for #38. Again, if you are a fan of HUGE alcohol, you are going to like this beer. Don't take my word for it. Give it a try. So, now that I have tried this beer, I have (still) tried all 15 of the top 15 on the Zymurgy list. I've tried 41 of the 52. I'm happy I can check this one off my list. Good luck getting Dark Lord... ;) I've had it once and wanted to go to Dark Lord Day ever since to try again. Of your remaining ones, I've had a great number of them. You could probably work a trade with BigD for Troegs and Bennett for the Surly (I did with both for both of those). Let me know if you need a hookup for AK or GBH (I have both in my fridge). I have Bell's as well, but no stout at the moment. As for Noble Pils, it will be a year-round beer starting sometime soon, as they replaced it as the spring seasonal with the Alpine.